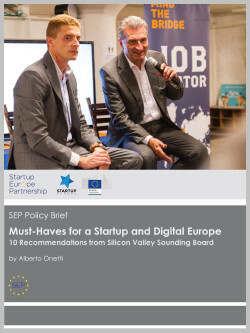 This Report includes the outcomes of the Startup Europe Comes to Silicon Valley (#SEC2SV) week and European Innovation Day (#MTBEID) Conference organized by Mind the Bridge and Startup Europe Partnership in Silicon Valley from September 21st through September 25th 2015, together with the main European organizations based in the Bay Area. Specifically, this report includes the recommendations provided by the SEC2SV Sounding Board. The SEC2SV Sounding Board is an informal group of selected Europe-born, Silicon Valley-based managers, entrepreneurs, and investors interested in supporting EU policy makers on policies re: Digital Single Market and Scale-up of EU Startup Ecosystem. The SEC2SV Sounding Board has been officially launched at SEC2SV 2015 during the European Innovation Day and privately met the European Commissioner for Digital Economy and Society Günther Oettinger on September 22nd. The conclusions of the discussions held during the European Innovation Day and the SEC2SV meetings have been reflected in this report, which was submitted to the European Commission on October 30th.